Shawls are practical, versatile, and an ever-popular project among knitters. 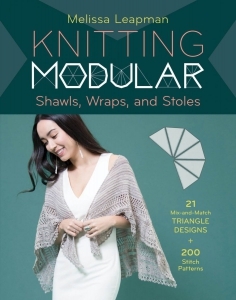 Noted designer Melissa Leapman has developed an innovative technique that literally promises hundreds - even thousands - of beautiful shawl design options in this one book! Beginning with a simple triangular wedge, Leapman shows how multiple knit triangles can be joined together to create square, rectangular, trapezoidal, and semicircular shapes. Her easy and customisable technique offers knitters endless flexibility in design and yarn choices. A helpful glossary of 212 stitch patterns is the final tool readers will use to select their favorite embellishment for the main fabric of their shawl. Instructional graphics and patterns for 20 designs originated by Leapman make the creative design process exciting and accessible for all levels of knitters. Knitters love to make shawls and with the easy, innovative techniques of Melissa Leapman, one of America's top knitting designers, they can create hundreds of custom shapes and looks, all from triangular wedges.